This coriander chutney for dosa and idli made of fresh coriander leaves is so delicious, healthy and easy to make. Coriander chutney using fresh coriander leaves (cilantro leaves) is popularly known as kothamalli chutney or malliyila chutney (in Kerala) in South India. 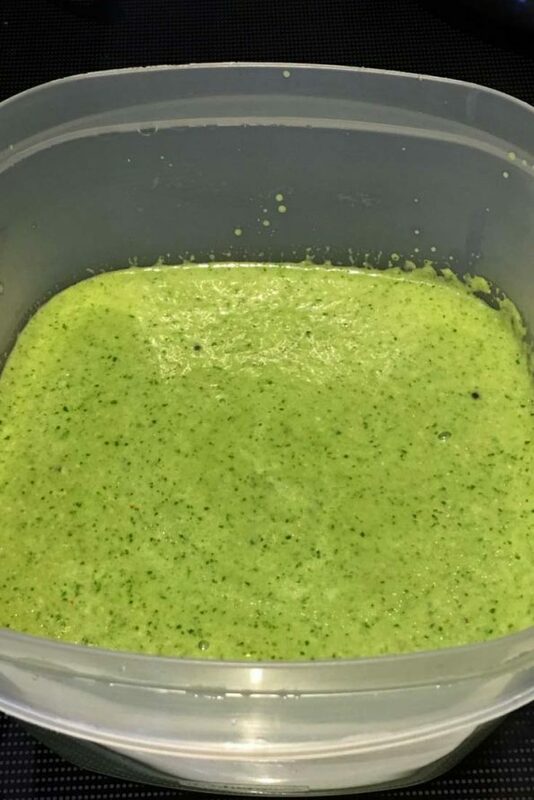 This is a very simple South Indian style green coriander chutney recipe which you can make so quickly and easily if you have fresh coriander leaves (cilantro leaves) and few other ingredients at your home. Coriander or cilantro leaves are known by the names kothamalli or malliyila in South India so this chutney recipe is also known by the names kothamalli chutney recipe or malliyila chutney recipe (malliyilla chammanthi where chammanthi refers to chutney). We use very few spices in this coriander chutney for dosa and idli, but this is very delicious, do give this a try(even if you are not a fan of green cilantro chutney) as this is different and tastes great when served with hot dosa or soft idlis for breakfast, snack or dinner. Just like you can serve this coriander chutney as a side dish for dosa or idli, you can also serve this green chutney as a side dish for snack items like vada for evening tea. In fact, this coriander chutney can also be used as a yummy side dish with chpathi or poori if you like. 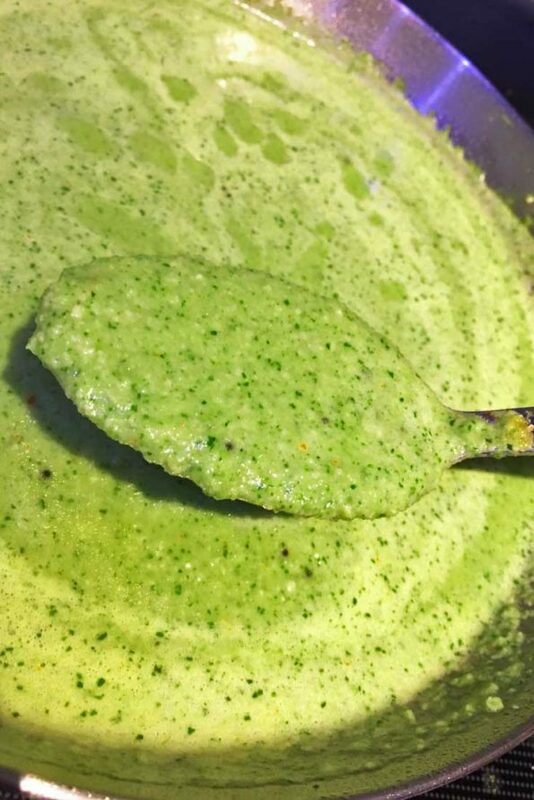 This coriander chutney is not made without coconut as we use grind coconut and also another delicious ingredient to add more flavor and thickness to the dish. 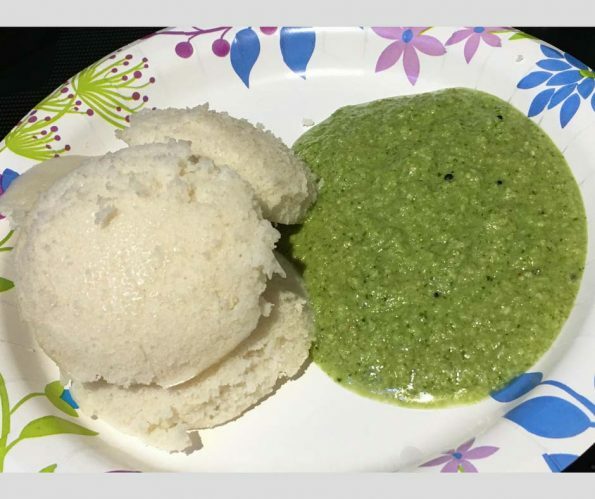 Even if you don’t love coconut chutney you should a least try this once to see how good this stuff really is, when you blend together the cilantro (coriander leaves), grated coconut and the other ingredients, which is cashew nuts, along with few spices. Please don’t skip the cashew nuts as the addition of cashew nuts makes this green chutney creamy and thick and so delicious. If you love coconut chutney for dosa and idli, here is my post on simple & yummy coconut chutney recipe, which goes great with dosa & idli. Sambar is another great side dish that goes great with dosa and idli, you can see sambar varieties (different sambar recipes) here. 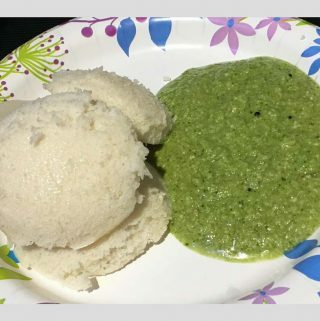 Below you can see the image of green coconut coriander chutney served with idli for breakfast. You can make the best idli dosa batter and make soft idlis following the idli recipe here. You can see how to make dosa here. There are other yummy side dishes for both idli and dosa which are not chutney or sambar, so see the collection of side dishes for idli and dosa in my blog here. 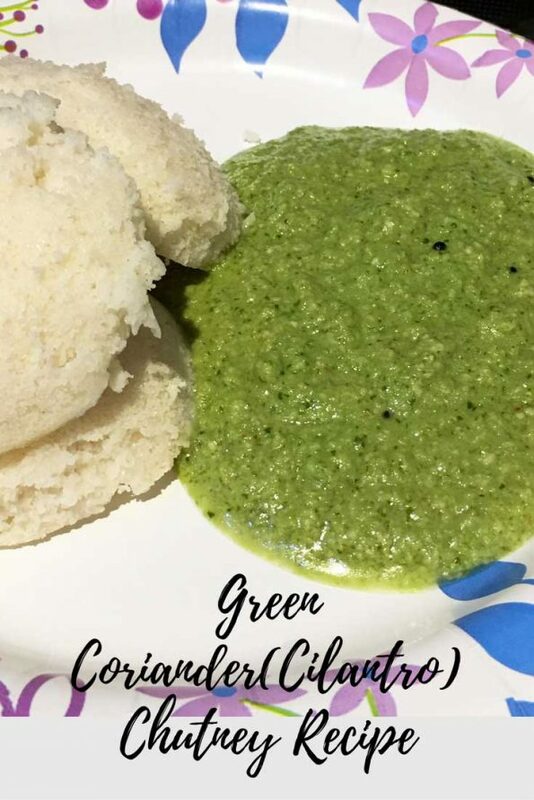 So here is how you can make this easy and yummy coriander chutney for dosa and idli following this easy green coriander chutney recipe. Coriander coconut chutney using fresh coconut and fresh coriander leaves (cilantro leaves) is a perfect quick, easy and delicious South Indian style side dish with idli, dosa, chapathi, poori etc. Wash the cilantro leaves (coriander leaves) and roughly chop. Transfer the coriander leaves, coconut, water and cashew nuts to a blender and blend until the mixture is smooth like the consistency required for chutney. When the mustard seeds splutter, add the coriander coconut mixture to the pan and mix well. Add salt, red chili powder and garlic, stir together everything until well combined. Bring the mixture to a boil, then reduce the heat and cook in low heat for about 2 more minutes. Easy and delicious coriander coconut chutney is ready! Serve the coriander chutney for dosa, idli or even chapathi or poori. You may soak the cashews in water for about 15 minutes in advance (discard the water used for soaking once its done) if you need to soften up the cashews before making the chutney, which will help you to make the chutney more smooth and creamier, but this step is not necessary for this coriander coconut chutney if you want to make it quickly. If you like, you can also add 1 to 2 tablespoons of filtered lime juice to add a little sourness to the chutney. Hope you found this post on coriander chutney for dosa and idli helpful!